The Nationals announced today that they have designated righty Carlos Torres for assignment. His active roster spot will go to prospect Erick Fedde, who was recalled to make a start today, as Chelsea Janes of the Washington Post reported yesterday on Twitter. Torres, 35, helped the Nats through some bullpen injuries and carried a solid 9:3 K/BB ratio in his 9 2/3 innings. But he also allowed seven earned runs on nine hits, including three long balls, during his time in the D.C. relief corps. It seems that this’ll be only a one-outing opportunity for Fedde. He could be retained as a relief option, though perhaps the likelier scenario is that he’ll go back to Triple-A to stay stretched out in case there’s a need for something more than a spot starter. Fedde, a former first-round pick and top-100 prospect, did not turn in a compelling debut effort last year with the Nationals. But he has shown better thus far in 2018 at Syracuse, where he carries only a 4.35 ERA but more promising peripherals — 9.2 K/9 against 2.8 BB/9 with a 50.4% groundball rate — through 41 1/3 innings. The Phillies signed Carlos Santana to a three-year, $60MM contract this offseason, pushing Rhys Hoskins to the outfield and rendering Joseph without an opportunity outside of a bench role. Phils skipper Gabe Kapler has been playing Joseph in the corner outfield this spring to enhance his versatility, but Joseph still faces an uphill battle when it comes to securing even semi-regular at-bats in a crowded first base/outfield mix with the Phils. Erick Fedde made his first appearance of the spring this week, taking the mound for the first time since suffering a flexor strain that ended his season last summer. MLB.com’s Jamal Collier spoke with the promising Nationals right-hander, stating that he felt no lingering effects in his previously problematic forearm. Collier notes, too, that Fedde’s velocity looks to be back to normal after dipping last summer before the right-hander was shelved for the remainder of the year. While the 25-year-old Fedde, a former first-round pick and longtime top prospect in the organization, comes with plenty of upside and hopes to break camp with the club, Collier notes that his remaining minor league options could make that difficult. Right-hander A.J. Cole is the current favorite for the fifth spot in the Nats’ rotation, perhaps in part due to the fact that he’s out of options. Jacob deGrom’s availability for Opening Day is in question, writes Kristie Ackert of the New York Daily News. While the back stiffness that’s been hampering deGrom in the past few days isn’t believed to be serious, the Mets would prefer deGrom to make five starts to ramp up for the regular season. In order to make that schedule, he’d need to start a game by Sunday, and he’ll likely need to complete two bullpen sessions before he’s cleared to do so. The New York Post’s Mike Puma takes things a bit further, suggesting that deGrom may not be ready for the first week or so of the season (Twitter link). It’s understandable that the Mets would prefer to proceed with caution after the rampant injuries that ran through their pitching staff last season, though, and it doesn’t sound at present that deGrom is in danger of missing any significant time once the regular season rolls around. Marlins CEO Derek Jeter was largely dismissive of the grievance filed by the MLBPA against his team (as well as the Rays, A’s and Pirates), per Barry Jackson, Clark Spencer and Jordan McPherson of the Miami Herald. “As we have done since the day we took over in October, we will continue to do everything we can to build a foundation for sustained success and improve this organization — which has not made the postseason since 2003 and has gone eight seasons without a winning record,” Jeter said in response to the grievance, which alleges that the four teams listed are not properly reallocating their revenue-sharing profits to improving their clubs. Sticking with the Marlins, Craig Davis of the South Florida Sun-Sentinel writes that non-roster invitee Scott Van Slyke has impressed manager Don Mattingly early in camp as he vies for a job. Mattingly, of course, knows Van Slyke well, having also managed him during his best years with the Dodgers. Van Slyke, Davis notes, changed his hitting mechanics this offseason at the behest of his father Andy — a two-time Silver Slugger winner and three-time big league All-Star. Of some note, Davis adds that Van Slyke’s minor league deal with the Fish does not contain an opt-out at the end of Spring Training, so even if he doesn’t make crack the 25-man roster, he could very well be ticketed for Triple-A New Orleans, where he’d serve as a depth option with a strong track record against left-handed pitching and experience in all three outfield slots. Matt Gelb of the Philadelphia Inquirer sat down with former Phillies pitching prospect Matt Imhof to discuss the tragic accident that derailed his once-promising career and left him without his right eye. His journey offers worthwhile lessons to everyone, especially those with a passion for baseball. The Diamondbacks are awaiting the results of an MRI on the right elbow of star first baseman Paul Goldschmidt, as Nick Piecoro of the Arizona Republic writes. Goldschmidt himself suggests he’s not too concerned about the discomfort he has experienced in the joint — he describes it as tightness that recedes once he has loosened up — though the team is surely wise to take a proactive approach with such a key player. Meanwhile, Diamondbacks infielder Nick Ahmed will undergo surgery after suffering a fractured wrist, as MLB.com’s Steve Gilbert tweets. Odds are, then, that he’s done for the year after twice suffering broken bones on pitched balls. The 27-year-old will qualify for arbitration this fall, though his injury-shortened season and lack of offensive output will tamp down on his earning power quite a bit. In just over three hundred total major league games, Ahmed has established himself as a quality defender but owns only a .226/.273/.345 batting line with twenty home runs. The Cardinals are dealing with a few position-player injuries, as Derrick Goold of the St. Louis Post-Dispatch writes. Infielder Matt Carpenter will likely undergo an MRI and may also require an injection to deal with ongoing shoulder issues. It seems those problems have nagged Carpenter all season long, though it became a particular problem during yesterday’s contest and may now require some rest. Outfielder Tommy Pham is also dealing with some shoulder difficulties, though he’s not expected to miss time at this point. Nationals righty Erick Fedde will be shut down for the rest of the season after he was diagnosed with a strained flexor mass, as Mark Zuckerman of MASNsports.com reports. Though GM Mike Rizzo explained that the injury isn’t all that worrisome — the strain occurred away from the elbow joint, which is not damaged — the club decided the time was right to put its best pitching prospect on ice. Fedde, 24, is generally seen as the organization’s top pitching prospect, though he has gone through some struggles over the second half of this season since moving up to Triple-A and then on to the majors. Depending upon the club’s offseason moves, Fedde could challenge for a rotation or bullpen spot next spring. Mets righty Matt Harvey is set to return from the disabled list Friday against the Astros, as Mike Puma of the New York Post notes. Harvey has been out since mid-June with a shoulder injury and hasn’t overwhelmed in his four rehab starts, but the Mets were enthused about his last outing, Puma writes. “When he threw in Double-A last time, the reports weren’t all that glowing,” says pitching coach Dan Warthen. “But [minor league pitching coordinator] Glenn Abbott was raving about this last one. Matt’s delivery was the same every pitch, and everything was coming out cleanly.” Harvey has seen most of his last two seasons derailed by injuries, but he’ll have a chance to salvage something from the 2017 season after pitching to a 5.25 ERA, 6.9 K/9 and 4.5 BB/9 in 70 1/3 innings before hitting the DL. Here’s more from the National League. Nationals righty Erick Fedde threw with less velocity than usual on Sunday, pitching in the 89-91 MPH range after previously throwing around 94, Chelsea Janes of the Washington Post writes. Fedde says he’s “not too worried about” the loss in velocity and attributes it to the approaching end of the season. Fedde, though, is still just under 100 innings for the season between the minors and the Majors after throwing 121 last year. Janes does note that Fedde has lately demonstrated a better-rounded repertoire than he showed in Spring Training, with a slower curveball and changeup to go along with his fastball and slider. The Pirates’ rotation hasn’t been overwhelming this season, but they have had good depth they largely haven’t needed, as Stephen J. Nesbitt of the Pittsburgh Post-Gazette writes. The Bucs have only used six starters, and one of those, Tyler Glasnow, has a 1.99 ERA with Triple-A Indianapolis and hasn’t pitched in the big leagues since early June. Steven Brault (1.94 ERA, 8.2 K/9, 3.3 BB/9, 52.2 GB%) has also fared well at Triple-A, with Drew Hutchison, Clay Holmes and Nick Kingham all also getting fairly good results. “It’s a good lesson in humility and patience,” says Brault. “You have to realize it’s not what you’re doing that’s wrong. Sometimes there’s just not a spot.” The Pirates control the rights to everyone in their current rotation for at least two more seasons beyond this one, so an offseason move or two could be a possibility, with Gerrit Cole perhaps being on the trading block. Kingham will be out of options next season, making his name one to watch as well. Of course, rotation depth charts have a way of changing quickly. July 27: The Nationals are officially terming Strasburg’s injury as a nerve impingement in his right elbow, per this morning’s announcement of Strasburg’s DL placement. Left-hander Sammy Solis has been recalled to give the bullpen some extra depth for the time being, while Fedde is slated to start in place of Strasburg on Saturday. July 26, 9:36pm: Manager Dusty Baker confirmed after the game that Fedde is coming up and that Strasburg will be placed on the 10-day disabled list (Twitter link via Chelsea Janes of the Washington Post). The skipper was “adamant” that Strasburg will only miss one start, Janes adds. 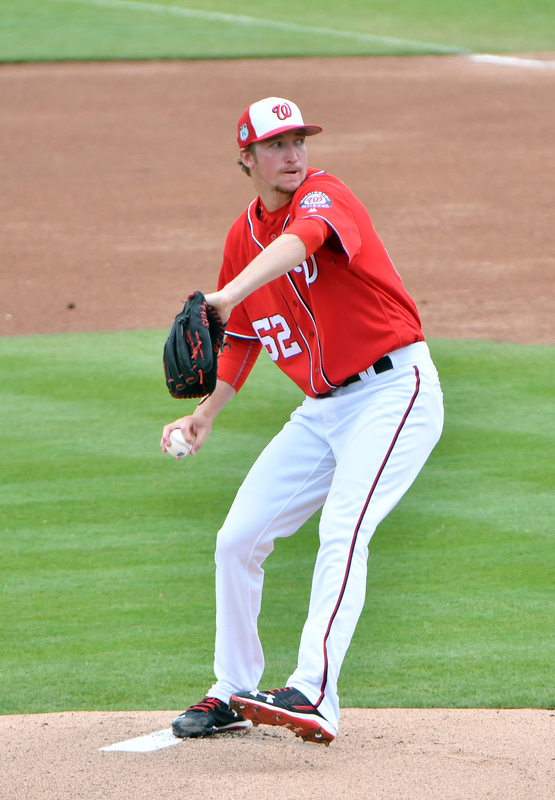 8:05pm: The Nationals are calling up top pitching prospect Erick Fedde, reports Joel Sherman of the New York Post (on Twitter). The former first-round pick, who ranked 70th on Baseball America’s midseason list of the game’s top 100 prospects, will likely start in place of Stephen Strasburg, Sherman adds. Fedde, 24, was Washington’s first-round selection in the 2014 draft. The Nats made him the No. 18 overall pick that season despite the fact that he had Tommy John surgery not long before the draft. He’s spent most of his career in the minors as a starter but was briefly moved to a relief role in part to limit his innings but also given the potential for a midseason promotion to help a struggling Nationals relief corps. The Nationals recently moved Fedde back to a rotation role, and while he was torched for six runs without recording an out in his initial return to the rotation, he’s allowed just three runs on 10 hits and no walks with eight strikeouts in his past 11 2/3 frames. Overall, he’s worked to a 3.72 ERA with 8.0 K/9 against 2.4 BB/9 with well above-average ground-ball tendencies in 77 1/3 innings between Double-A Harrisburg and Triple-A Syracuse this season. Fedde dropped out of the top 100 on MLB.com’s midseason rankings, but Jim Callis and Jonathan Mayo still rank him third among Washington farmhands. Their report notes that he sits 91-94 mph with his fastball and can run his velocity a bit higher when needed. He pairs that with a plus slider, average changeup and above-average control, giving him a third starter’s ceiling, per Callis and Mayo. While this seems like it could very well be a spot start for Strasburg, whose injury isn’t believed to be serious, there’s an obvious opening at the back of the Washington rotation as well. Joe Ross underwent Tommy John surgery earlier this month, and the Nats have since relied on veteran Edwin Jackson to make a pair of starts. Jackson has been serviceable in those two outings, but Jackson struggled with the Orioles earlier this season and hasn’t enjoyed big league success as a starting pitcher since 2012 (his last run with the Nationals). While the Nationals are in on Tigers left-hander Justin Wilson, they won’t part with top prospects Victor Robles, Juan Soto or Erick Fedde in a trade to acquire him, tweets MLB Network’s Ken Rosenthal. Per Rosenthal, the Red Sox, Dodgers and Astros are all still in the mix for Wilson. Heyman tweets that the Rays are still looking at Wilson, to whom they were linked earlier this week, but at this point it seems that other teams are likelier to land him. MLB.com’s Jon Morosi, meanwhile, adds the Brewers to the substantial group of teams looking into Wilson (Twitter link). USA Today’s Bob Nightengale tweets that the Royals are closely monitoring Cardinals right-hander Lance Lynn to see if St. Louis makes him available between now and the deadline. ESPN’s Buster Olney reported earlier today that the Royals are looking around for not one but two rental starters to try to make one last run with their current core, and as a free agent at season’s end, Lynn would fit that mold. If the Royals are indeed watching, they probably didn’t mind what they saw today when Lynn tossed six innings of one-run ball against the Mets, though he did allow his 21st homer of the season, which is already far and away a career-high. Newsday’s Marc Carig and ESPN’s Jerry Crasnick both hear that Addison Reed is drawing the most interest among Mets trade chips, though Carig notes that there’s nothing close to being completed at this time (Twitter links). The rumor circuit on Reed has been surprisingly quiet, though he’s been linked to the Yankees and Red Sox thus far. The 28-year-old Reed has tossed 45 excellent innings out of the New York bullpen, averaging 9.4 K/9 against a ridiculous 1.00 BB/9 with a 38.8 percent ground-ball rate en route to a 2.40 ERA. He’s logged a 2.02 ERA in 138 innings as a Met and is earning $7.8MM this season.